First picking of tomatoes of about ten pounds of various. 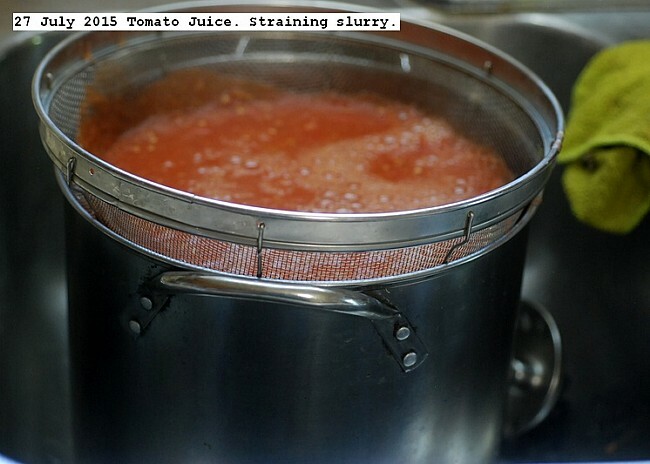 Five pounds of the best were selected for the table and the remainder was made into juice for current use.Tomatoes were cut into quarters, placed in a pot with a liter of water, boiled until soft and hand blended into a slurry.The slurry was strained through a screen and the residue was put through a Champion juicer to extract all nutrients. Two liters plus a glass of juice was obtained and will be utilized for current consumption.